The window of Miss D'Armande's room looked out onto Broadway and its theatres. But Lynette D'Armande turned her chair round and sat with her back to Broadway. She was an actress, and needed the Broadway theatres, but Broadway did not need her. She was staying in the Hotel Thalia. Actors go there to rest for the summer and then try to get work for the autumn when the little theatres open again. Miss D'Armande's room in this hotel was a small one, but in it there were many mementoes of her days in the theatre, and there were also pictures of some of her best friends. She looked at one of these pictures now, and smiled at it. 'I'd like to know where Lee is now,' she said to herself. She was looking at a picture of Miss Rosalie Ray, a very beautiful young woman. In the picture, Miss Ray was wearing a very short skirt and she was sitting on a swing. 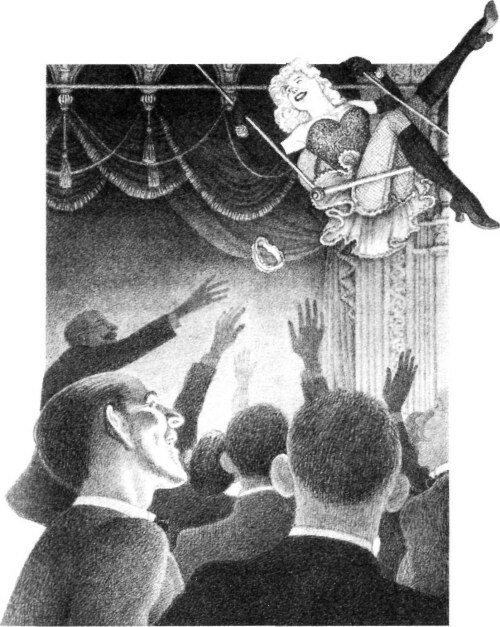 Every night in the theatre she went high in the air on her swing, over the heads of all the people. When she did this, all the men in the theatre got very excited and stood up. This was because, when her long beautiful legs were high in the air, her yellow garter flew off and fell down to the men below. She did this every evening, and every evening a hundred hands went up to catch the garter. She did other things. She sang, she danced, but when she got onto her swing, all the men stood up. Miss Ray did not have to try very hard to find work in the theatre. After two years of this, Miss D'Armande remembered, Miss Ray suddenly left the theatre and went to live in the country. And seventeen minutes after Miss D'Armande said, 'I'd like to know where Lee is now', somebody knocked on the door. It was, of course, Rosalie Ray. 'Come in,' Miss D'Armande called, and Miss Ray came in. Yes, it was Rosalie. She took off her hat, and Miss D'Armande could see that she looked very tired and unhappy. 'I'll tell you, Lynn, but give me a drink first.' 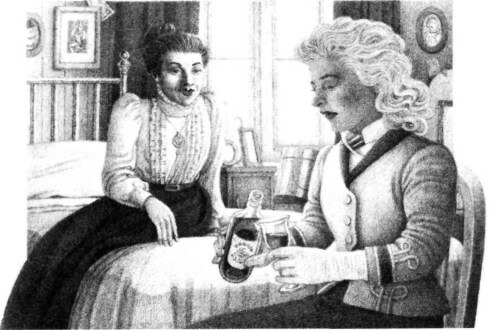 Miss D'Armande passed a bottle to her friend. 'Ah, that's good!' said Rosalie. 'My first drink for three months. Yes, Lynn, I left the theatre because I was tired of the life, and because I was tired of men -well, the men who come to the theatre. You know we have to fight them off all the time. They're animals! They ask you to go out with them, they buy you a drink or two - and then they think that they can do what they want! It's terrible! And we work hard, we get very little money for it, we wait to get to the top -and it never happens. But most of all, I left because of the men. 'Well, I saved two hundred dollars and when summer came, I left the theatre and went to a little village by the sea on Long Island. I planned to stay there for the summer, and then learn how to be a better actress. 'But there was another person who was staying in the same house - the Reverend Arthur Lyle. Yes, Lynn, a man of the church! When I saw him for the first time, I fell in love with him at once. He was a fine man and he had a wonderful voice! 'Well, it's only a short story, Lynn. A month later we decided to marry. We planned to live in a little house near the church, with lots of flowers and animals. 'No, I didn't tell him that I was an actress. I wanted to forget it and to put that life behind me. 'Oh, I was happy! I went to church, I helped the women in the village. Arthur and I went for long walks - and that little village was the best place in the world. I wanted to live there for ever . . .
'But one morning, the old woman who worked in the house began to talk about Arthur. She thought that he was wonderful, too. But then she told me that Arthur was in love once before, and that it ended unhappily. She said that, in his desk, he kept a memento - something which belonged to the girl. Sometimes he took it out and looked at it. But she didn't know what it was - and his desk was locked. 'That afternoon I asked him about it.
' "Ida," he said, (of course, I used my real name there) "it was before I knew you, and I never met her. It was different from my love for you." ' "Was she beautiful?" I asked.
' "She was very beautiful," replied Arthur.
' "Did you see her often?" ' "About ten times," he said.
' "And this memento - did she send it to you?" ' "It came to me from her," he said. ' "Why did you never meet her?" I asked.
' "She was far above me," he answered. "But, Ida, it's finished. You're not angry, are you?" "Why, no. I love you ten times more than before." And I did, Lynn. Can you understand that? What a beautiful love that was! He never met her, never spoke to her, but he loved her, and wanted nothing from her. He was different from other men, I thought - a really good man! 'About four o'clock that afternoon, Arthur had to go out. The door of his room was open, his desk was unlocked, and I decided to look at this memento. I opened the desk and slowly I took out the box and opened it. 'But, Lee, what was in the box?' Miss D'Armande asked. 'It was one of my yellow garters!' cried Miss Ray.